For anyone who loves blueberries or who is trying to fit more fruit into their day, this is a deliciously delicate, fresh breakfast / brunch dish for a lazy weekend. Sourdough works very well as the base for the whipped ricotta and blueberries, as it retains its structure under the sticky liquid released from the berries and doesn’t fall to pieces. I used Khorasan sourdough last time I made this, which has a lovely almost corn / maize like, buttery flavour (if you want to try making your own Khorasan sourdough, there is a recipe in “A Handful of Flour” for this, which blends the Khorasan with some strong white bread flour). A creamy white sourdough also works well. Multiply the ingredients for the number of people as required. Place your ricotta in a medium sized bowl, add a dash of milk to loosen, and whip it until creamy using a hand whisk. This also gets rid of any lumps. In a small saucepan, melt the butter and honey over a low heat. Add the blueberries, a sprinkling of thyme leaves (leave some back to garnish), and a light squeeze of fresh lemon juice. Gently stir for 3-4 minutes until the blueberries have released a delicious purple juice, but stop before they start to burst or disintegrate. They should just be warmed up and releasing their flavour. Meanwhile, toast your bread (you can do this under the grill if you’re doing a large batch). 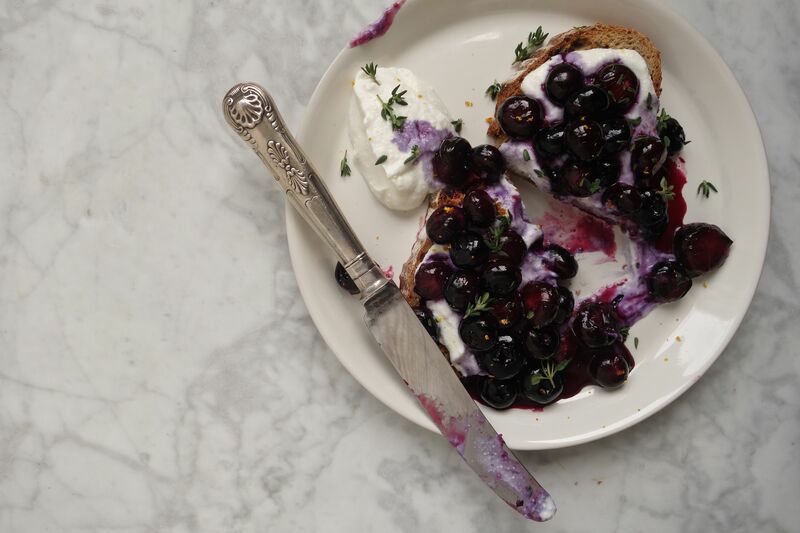 Spread the toast with a generous helping of whipped ricotta, and pour the hot blueberries along with all their syrup over the top. Garnish with a little extra thyme and a grating of lemon or orange zest. Eat immediately.